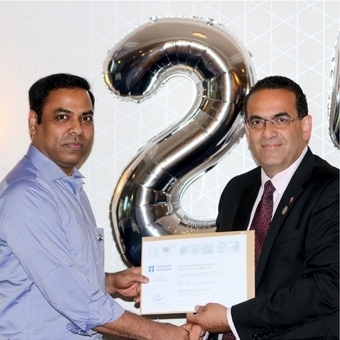 Dr Dune Apparao was presented with the Clinical Assistance Award by Professor Rami Abboud at the Department of Orthopaedic & Trauma Surgery’s special celebratory dinner commemorating 25 years of the MCh (Orth) course on 2 June 2018. This ‘Clinical Assistance Award’ was initiated In 2014 and is issued on the recommendation of the Ninewells Hospital Clinical Lead and Consultant Orthopaedic Surgeon, Mr Sankar Sripada, who oversees and examines the MCh (Orth) clinical e-log book. This certificate is not necessarily awarded annually but rather it is given only in exceptional circumstances in recognition of a candidate who, on the recommendation of the clinical e-log book examiner and ratified by the examiners board committee, has assisted and observed diligently in operating theatres and clinics throughout the MCh (Orth) degree. Dr Apparao’s research project, “Prediction of post-operative scores for patients with total hip replacement using pre-operative information” was supervised by Dr Weijie Wang (Senior Lecturer at the TORT Centre). Dr Dune Apparao participating in (left) cadaveric upper limb workshop, and (right) dry bone upper limb workshop.